After a week without a budget, is a deal any closer? Are state lawmakers any closer to passing a state budget after a week without one? House Speaker Joe Aresimowicz, D-Berlin, said during an interview, however, that he is aiming for July 18 for a vote in his chamber on a budget. His caucus last week released a proposed budget. “It is still the House Democrats’ plan to come in on the 18th, not necessarily to vote on what we put out last week, but we are using that as a base for negotiations,” he said during an interview. Senate Republican Leader Len Fasano said if no budget deal is reached before that date, then the budget of each caucus and the governor’s should be voted up or down that day. 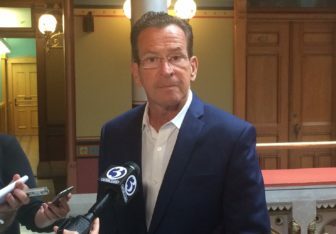 Malloy, a Democrat who has negotiated six previous state budgets, said the problem is that Democrats in the House are not in agreement with Democrats in the Senate. The same is true for Republicans in each chamber. Malloy reiterated his displeasure with efforts to increase taxes to help close the state’s deficit. A House Democratic budget proposal released last week proposed increasing the sales tax rate to raise about $420 million more each year. The Democratic plan rejected a proposal from the governor to bill municipalities $400 million to help cover escalating teacher pension costs – a move many local leaders said would surely result in higher property taxes. This divide has yet to be resolved. “I want to get a budget,” Malloy said. “I don’t want to be a governor of a state that is being run by executive order. It’s not what I ran for. It’s not something that I want to see done, nor do I believe that we should have a revenue-driven discussion. We’ve got to make some changes. People have to move,” he said. Adam Joseph, spokesman for senate Democrats, was unable to say how close his caucus is to reaching a deal with others. “We’re continuing to hold discussions,” he said during an interview.